CHICAGO — My sister, Gianina, gave me two choices. The first: she brought me a burger place with the usual menu. It was empty, but according to her, the restaurant had proclaimed itself as having a strong cult following. The second– she brought me to a highly-recommended Japanese restaurant in Illinois. Of course, I chose the second. And so, from the Ohare, we took a 30-minute drive to Glenview in Illinois’ Cook County. The place: Ra Sushi Bar and Restaurant. 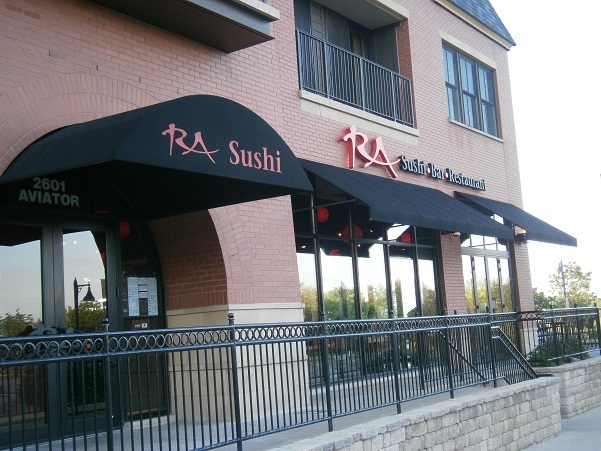 I found out later that Ra is a chain of restaurants owned by the Benihana group (no wonder the food is good!). They opened in 1997, and also has restaurants in California, Nevada, Arizona, and a few other states. My sister and I arrived at about 6:00 p.m. The sun was still pretty much up, being summer, and we were there for happy hour! Which meant some dishes’ prices being slashed to almost half! Yipee! The cooking style is fusion, and it was evident in all the dishes we ordered. Ok, I don’t have margaritas everyday. But yes, I ordered one again. Hehehe. We each had the Miyagi Margarita, which you can have in mango, strawberry, or cucumber flavor. We chose mango. The blend was just right. It had enough kick, but not too much. 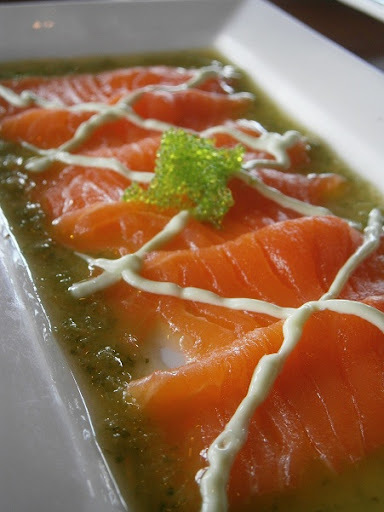 Next, we had the Salmon Carpaccio, which had wasabi-infused oil on the side. It wasn’t bad at all. However, when it comes to salmon sashimi, I would always prefer the salmon standing out as the primary flavor. The wasabi-infused oil somewhat stole the show from the main act. 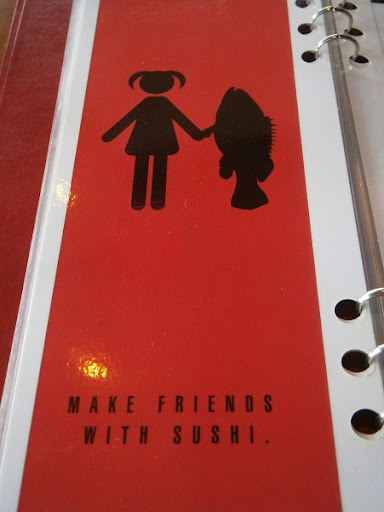 So, I would have second thoughts about ordering this next time. 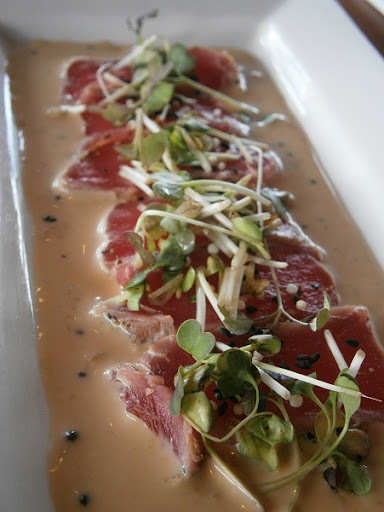 What I did love a lot, however, was the Seared Tuna with soy dressing, black sesame seeds, Japanese rice cracker bits, and according to Ra, organic micro greens. I loved, loved, loved the way all the ingredients worked together. The soy dressing was very creamy, while the greens provided some crunch. The tuna, of course, was very fresh. We got two kinds of sushi. Viva Las Vegas was the most recommended. It’s a roll that has kani (crab sticks), cream cheese, spinach tempura bits, and had a sweet eel sauce. The sushi tasted very creamy, which was a perfect contrast to the crunch provided by the tempura bits. Winner. No wonder, in 2007, there has been a total of 1,000,000 orders for this dish. We partnered the Viva with Ra’s Tootsy Maki. 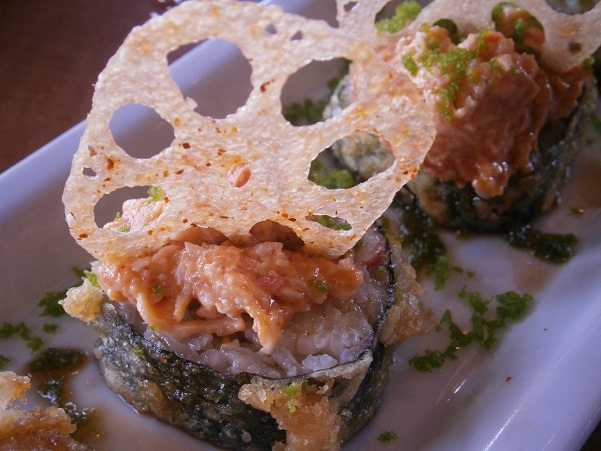 The Tootsy Maki has kani, shrimp, and also has sweet eel sauce. It was delicious and crunchy. Although, if I am asked to choose only one between this and the Viva, I’d go for the latter. I actually wanted to get another order of Viva. But in order to try out more dishes, we went for the Ra’ckin Roll. 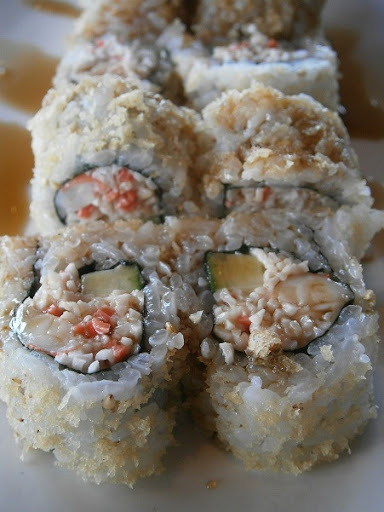 It’s a colorful, crunch roll (yet again) of kani, shrimp, and cream cheese. It’s topped with–guess what!– guacamole! 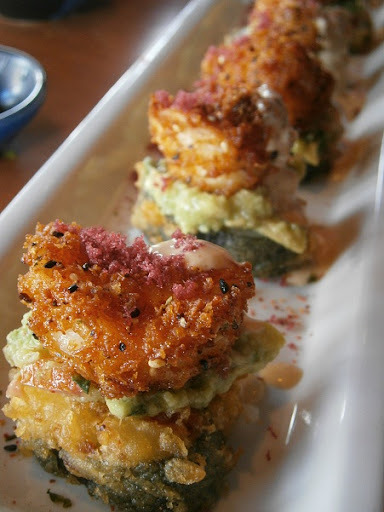 And, it is also topped with tempura-battered shrimp. I loved how colorful the roll is. Another creamy winner. A page from Ra's menu. I can relate. Hehehe. Finally for dessert: Cinnamon Tempura Ice Cream. It’s cinnamon ice cream on top of deep-fried pound cake (tempura style). I don’t get to have cinnamon ice cream often enough, so this one was a real treat. I also liked its contrast to the pound cake. 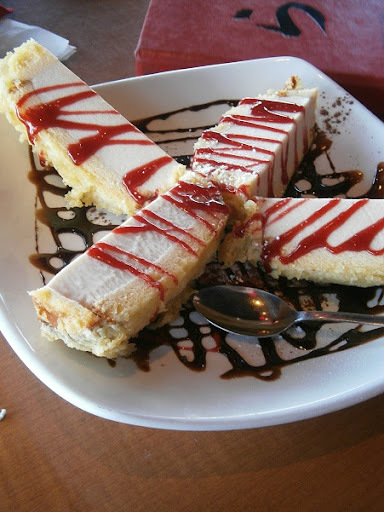 It’s topped with a choco-raspberry dressing. The serving size, by the way is humongous! For its relatively cheap price, it can serve 4 people already. You will love this place. 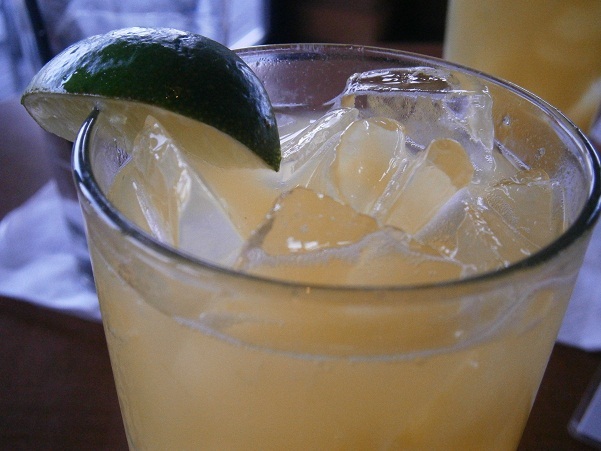 Best time to go is during happy hour, which is 3:00 to 7:00 p.m. from Monday to Saturday. This entry was posted in Rated by Ralph, Restaurants & Food Trips, Travel and tagged Chicago, Chicago Dining, Chicago Food, Illinois, Japanese Restaurant Chicago, Ra Japaenese Restaurant, Ra Sushi, Ra Sushi Bar Restaurant, ralph guzman, RatedRalph, RatedRalph.com by Ralph. Bookmark the permalink.